Free agent Johnny Manziel may have yet another hurdle to overcome before getting back onto an NFL roster. A Dallas County grand jury indicted Manziel on a charge of misdemeanor assault with bodily injury in relation to an alleged altercation with his ex-girlfriend, ABC News 8 in Dallas and CBS Dallas/Fort Worth reported. The grand jury heard the case on Thursday. A formal announcement is expected Monday. The former Cleveland Browns quarterback is accused of assaulting his ex-girlfriend, Colleen Crowley, in Dallas in late January. Crowley claimed Manziel hit her so hard he burst her ear drum while driving from a Dallas bar back to her home in Fort Worth. According to police records, Crowley tried to jump out of the car—while it was still moving—but Manziel stopped, dragged her back into the car and hit her again. 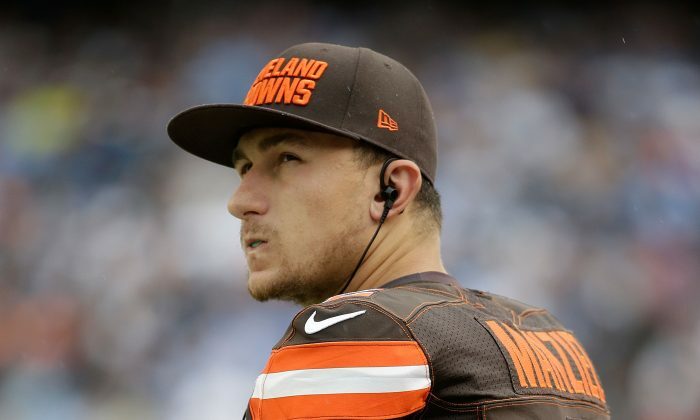 A judge has granted Crowley a protective order against Manziel. The former Heisman winner has to stay at least 500 feet away from her home and place of work until February of 2018. He also can’t possess a firearm while the order is in effect. Manziel, a dual-threat quarterback, was Cleveland’s first-round draft pick out of Texas A&M in 2014. But he struggled in his first professional season on the gridiron, while making plenty of headlines with his partying off-the-field. After spending last offseason in rehab, he looked improved in 2015, yet lost his starting position for allegedly lying to coaches about his off-the-field partying habits. This offseason has not only been highlighted by Manziel’s assault charge against his ex-girlfriend, he’s also been dumped by a pair of NFL agents, he’s lost his endorsement deal with sports apparel giant, Nike, and been accused of causing some $32,000 worth of damage at a house he rented in West Hollywood.